A Disunited Party’s Successful Convention The Democrats preview the strategy they hope will dismantle Donald Trump. The showbiz headline from the Democrats’ convention in Philadelphia is that they did fine. They have their nominees; they had good speeches and glamorous celebrities; the cameras panning the audience often caught glistening faces, not angry ones. It did not look unified but it did look alive. So the impression was of relative success. The historical headline is something different, and should not be lost in the stagecraft. It was captured in two events. The first was the moment, early Monday afternoon, when Bernie Sanders lost control of his movement. His rally audience jeered the idea of unity, refused to cheer Hillary Clinton, failed to boo Donald Trump lustily. A flicker of disoriented surprise crossed Mr. Sanders’s face. He was no longer riding the tiger, it was riding him. The second was the moment when Leon Panetta—former chief of staff to a Democratic president, former defense secretary and CIA director, longtime and reliable partisan—was jeered at the convention Wednesday. “No more war!” they chanted when he spoke of terrorism. He looked mildly concussed. Get used to that expression, we’re going to be seeing more of it. The Democratic Party is turning left. It’s not about “Bernie” now, and his followers are not going away. It is about the political impulses of the party’s young, which is to say its future. They are part of a tide of the passionate, the ideological and the underinformed. They have no idea what socialism is or what it has done in the past to great nations, and they appear to want it. I guess we’ll have to go through that argument again. They have already pushed Mrs. Clinton left and, should she become president, will push her further, against her wishes. But she has a new base to keep close. This shift is a real historical development. President Obama has been an unusually strong helper and supporter of Mrs. Clinton, and this is assumed to be linked to interest in his legacy. Successful presidents tend to be followed by presidents from their own party. But it is more than legacy, or loyalty. It is a desire to avoid humiliation. If Mr. Trump wins, voters will be saying more than that Mr. Obama’s leadership didn’t quite work. They’ll be saying he was such a failure that they lurched desperately toward someone who’d blow the whole system up. Mr. Trump’s election would be a stinging rebuke, one for the history books. Mr. Obama will give everything he has to keep that from happening. The most electric line did not come from a politician. It came Thursday from a man named Khizr Khan, an American Muslim whose son, a U.S. Army captain, died in combat after 9/11. Mr. Khan said to Mr. Trump, who did not serve in the military: “You have sacrificed nothing.” The crowd roared to its feet at those four damning words. Joe Biden was good and returned the word “malarkey” to the lexicon, for which God bless him. Tim Kaine was fine. I observed in 2008 that his charm is that he seems not like the man in first class but the man in coach who may be the air marshal. He is charming, but we will see the next few months if there’s something servile there. As for Mrs. Clinton, I didn’t agree with the idea it had to be the speech of her life. It would be an important speech and would do her good if she got it right. Otherwise it was a big speech in a quarter-century of big speeches. It’s not as if people don’t know what they think of her. She did herself no harm. She didn’t help herself as much as she might have. The speech was workmanlike. It sounded like things she’d said before. 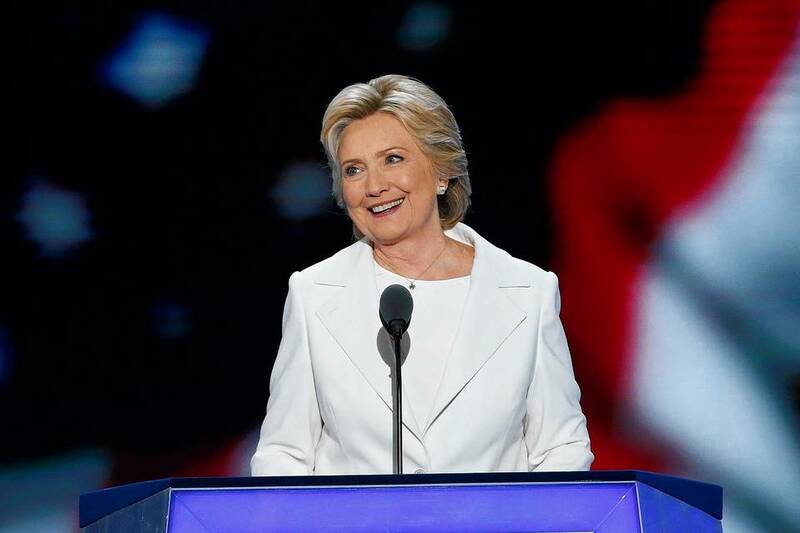 She wore a radiant white suit and looked wonderful, relaxed and happy. The speech was ploddingly progressive and at moments relatable. She did not do what I thought she’d do—something new. She finished stronger than she started. It used to be both parties had their conventions and then rested a while, beginning the campaign proper on Labor Day weekend. Not this year. The battle continues tomorrow and will not let up until Nov. 9. The big thing we found out in the convention is exactly how Democrats will attempt to dismantle Mr. Trump piece by piece. He’s not just reckless, he’s ridiculous—a fraud in business, a screwball, unserious and uninformed about policy. They’ll try to drive him crazy, too, quite deliberately. They’ll do this not by quoting him accurately and denouncing his views, but by misquoting him, putting a twist on what he said, and then denouncing him. They’ll try to get him to whine, whinge, blow his top. They’re doing it already, to their profit. They’ll play the picador tormenting the bull, goading him, weakened, into an unfortunate charge.